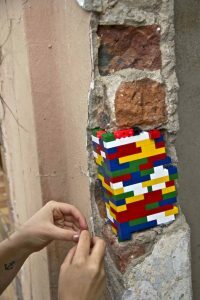 Jan Vormann is a German artist became famous thanks to a truly original idea: to fill the cracks of old walls, buildings and dilapidated structures with Lego bricks. 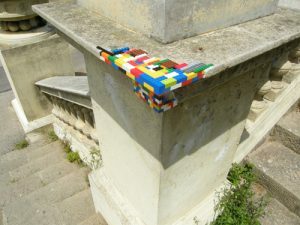 The experiment, despite his art studies in Berlin, began during a visit to Rome by that time, thanks to his travels that have taken him around the world, has managed to put his signature everywhere. the aim is, through a satirical criticism, counter excessive seriousness of the citizens groups and to make them more cheerful and livable spaces.